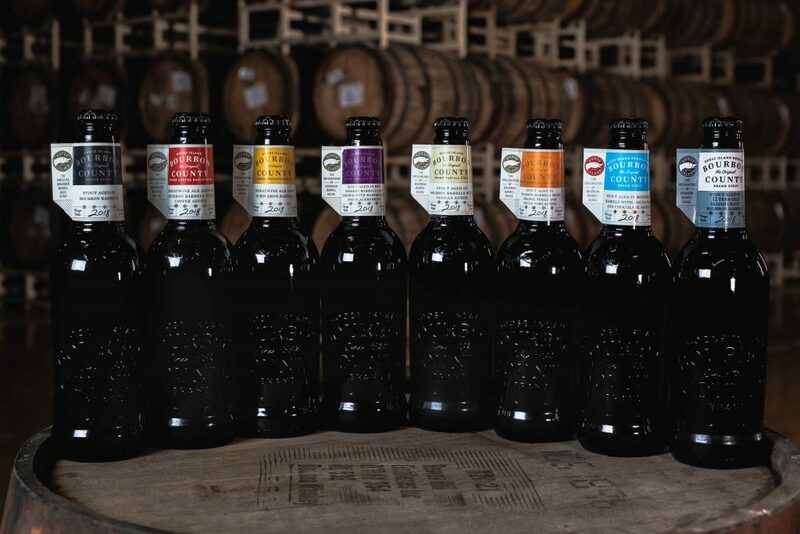 The Hop Review got an early preview of this years line-up of Goose Island’s Bourbon County Stout lineup. Black Friday lines will be waiting around the block for beers like Bourbon County Brand Wheatwine, Bourbon County Brand Bramble Rye Stout, and Bourbon County Brand Midnight Orange Stout. Hit the jump for the full list with descriptions from Goose Island. The same recipe as BCBS, but aged in 12-year old “Elijah Craig Barrel Proof” bourbon barrels. This bourbon was awarded 2017 “Whisky of the Year” by Whisky Advocate, the top honor in the world of international whiskey. Reserve is intended to showcase the nuances of a premium single source, and highly sought after bourbon. This year’s Proprietor’s explores the broad spectrum of chocolate. Using a combination of dark chocolate and two types of cocoa nibs, this rich and decadent beer highlights the whole range of chocolate from smooth and silky milk chocolate flavors, to deep and earthy dark chocolate. This longtime favorite is making a long-awaited return to the BCBS roster. Utilizing whole grade A vanilla beans from Madagascar, this year’s BCBS Vanilla delivers on all the quintessential things fans love about this variant: aromatic vanilla, marshmallow, toffee, oak and floral notes highlighting the creamy mouthfeel and enhancing the chocolate flavors that are ingrained in BCBS. For this variant we aged Bourbon County Stout in rye whiskey barrels then added raspberry and blackberry juice and puree from Michigan and Washington. The result is complex jammy fruit notes that are prominent, but well integrated with the caramel and chocolate flavors of the beer and spicy rye character from the barrels. Working with our friends at Intelligentsia, we flew down to Guatemala to source some of the world’s best coffee to use as we release the first-ever Coffee Barleywine. The beer is an English-style Barleywine, meaning malt forward, and aged in 4+ year old Heaven Hill Bourbon barrels before adding La Soledad coffee beans right before packaging to retain a bold coffee aroma and flavor. Brewer Oscar and Quality Analyst Paul created the concept for this new variant of BCBS. The result? Midnight Orange. They combined two things we love, orange and chocolate, taking Bourbon County into a new and exciting direction. While the chocolate compliments the Bourbon County base, the orange zest offers a point of contrast for a bold new flavor profile to delight Bourbon County fans and newcomers alike. With dual inspiration from a favorite childhood treat and an exquisite Mexican Mocha the bright, orange aroma provided by the fresh Spanish orange peel leads into a rich cocoa flavor.